So much for that bounce higher! I doubt this pair could sustain its upside momentum now that New Zealand printed a weak quarterly CPI. Here’s what I decided to do. I had been holding to this long position for nearly a month already, thinking that price was in for a strong rally after breaking past the neckline of its double bottom formation. The pair seemed to gain some traction after the .7000 handle held as support in the past few tests, so I’ve adjusted my stop higher to get me out of the position in case the floor breaks. However, the latest CPI release from New Zealand convinced me to just cut my losses quickly. The report showed a flat inflation reading for Q2 instead of the projected 0.2% uptick, dashing hopes that the RBNZ could announce an interest rate hike soon. This goes against my expectation that the central bank could switch to a more hawkish stance in the coming months, something that might take NZD/CHF up to my PT near the .7300 mark. Risk appetite also seems to be shaky at the start of this week, as traders seem to be waiting for more signs that the previous rallies could carry on. So far, resurfacing Brexit concerns are keeping risk-on flows in check and the upcoming ECB and BOJ decisions could prolong the cautious mood. As I’ve mentioned in my Q2 2017 trading performance review, I’ll be more conscious of short-term market factors in terms of making risk adjustments to my trades. Hopefully I don’t regret this decision to hop out of my long Kiwi position later on, though! I spy with my one good eye this classic downtrend reversal signal on NZD/CHF. This setup lines up neatly with my fundamental biases, too! All clear on the northbound route for Kiwi now that the RBNZ refrained from talking down the currency during this week’s policy statement. 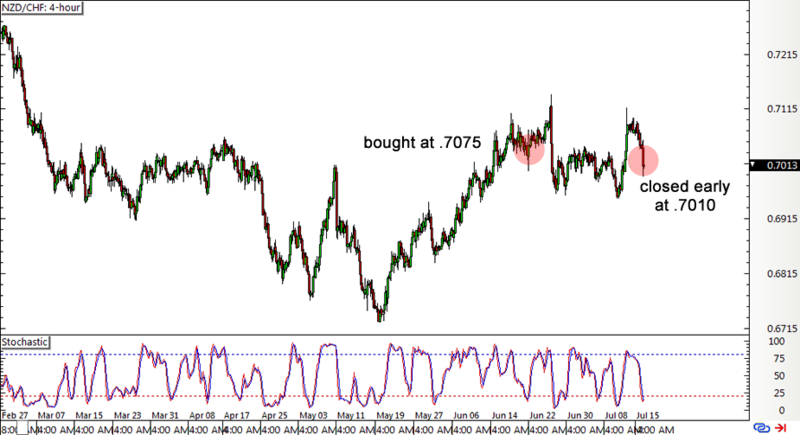 Here are my NZD/CHF entry levels. Tight range-bound action on this pair led me to consider exiting early, but I think we’re seeing some momentum right now. I’ll be making these adjustments anyway. So much for that bounce higher! I doubt this pair could sustain its upside momentum now that New Zealand printed a weak quarterly CPI.